Five years ago in Germany, a bland vegetable caused one of the more devastating outbreaks of food-born illness in recent years. Fifty three people died and nearly 4,000 were hospitalized due to a particularly gnarly strain of E.coli. It caused bloody diarrhea and kidney failure in many people. 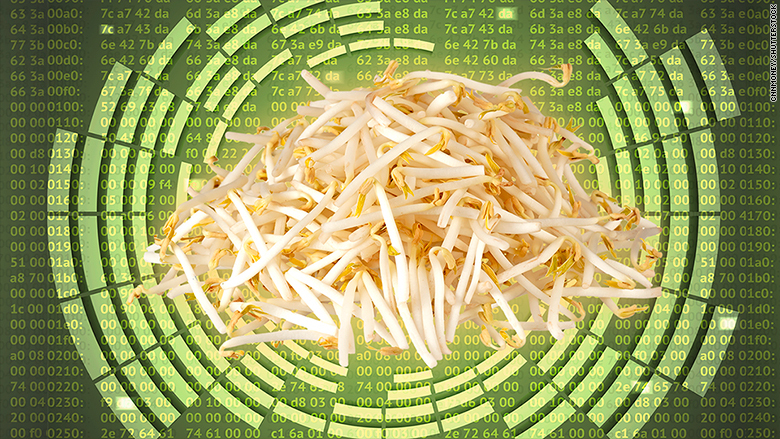 It took officials weeks to 60 days to officially identify the culprit: German grown bean sprouts sold through grocery stores. Scientists at IBM (IBM) want to drastically cut down on the time it takes to pinpoint the cause of a food-born illness like E.coli, norovirus and salmonella. Its researchers have developed a way to tap into grocery stores' existing scanner data to quickly identify possible foods using big data and machine learning. "We were thinking about why the investigation took so long ... if there was something we could do to accelerate this process," said Jeff Welser, vice president of IBM Research. For the past three years, a research group -- led by the IBM's Kun Hu, a public health research scientist -- has built a modeling tool to use immediately after at least 10 cases of a food-borne illness are reported. The group starts with something most grocery stores already have: inventory records. The information gathered by retail scanners show what foods were sold when. That data is compared to details about individual illnesses, specifically where they fell ill. Using this method, IBM says it can do the computations in a couple of hours and narrow it down to the top three to five suspects. To help zone in on the possibilities, they also rank foods by risk level. Traditionally, health officials asked each person for a list of everything they ate in the past 10 days. Not surprisingly, that information is often unreliable (do you remember every ingredient in all your meals for the past 10 days?). In the future, the technology could be used to predict an outbreak before it happens by tracking the supply chain. Looking for subtle changes in the more benign bacteria could lead to hints about the next shipment. Right now, the system is only designed for grocery stores, even though 40% of food-borne illness outbreaks start with restaurants. Down the line, the group will consider ways to work with restaurants. Some of the underlying technology could be applied to mapping the spread of other types of diseases, too. Speeding up the investigations wouldn't just save lives; it would also save million of dollars in lost revenue for farmers and stores. The 2011 outbreak resulted in a 115 million euro loss to farmers and growers in Europe. At the height of the German outbreak, officials incorrectly called out Spanish-grown cucumbers as a possible cause. Though they later said it was untrue, the damage was already done and Spanish farmers millions of dollars. Even after they were vindicated, sales of the crop suffered for years.